NY 14 originally came into Elmira on Broadway. 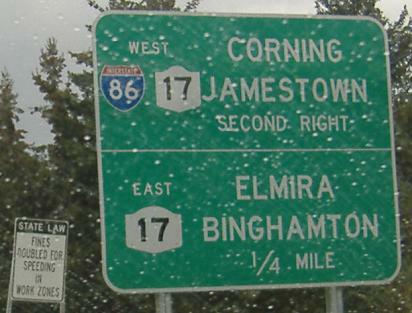 Later, it used current NY 352 eastward to the Elmira Bypass, which is now part of NY 17 (future I-86) but still has "14" reference markers on the side. Once NY 17 came through as a highway instead of the old surface road, NY 14 went back onto Broadway until 2001, when Clemens Center Parkway was completed. 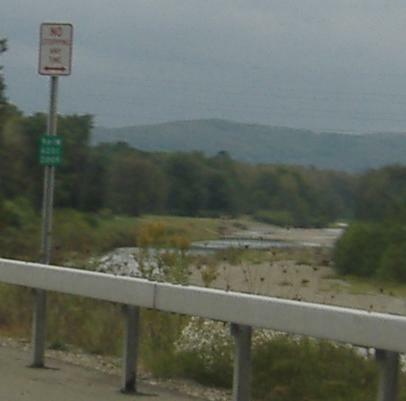 The Parkway lost its reference route designation (NY 961M) and became NY 14 at that point. The creek that runs next to Clemens Center Parkway, and a couple of representatives of the little 961M reference markers. 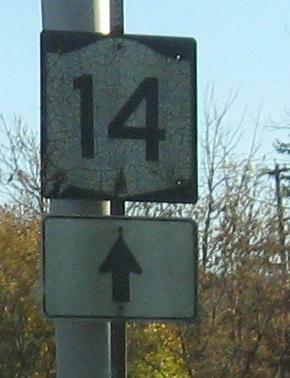 Much older markers, the first one possibly with original-style dashes (or an experimental variant), on Pennsylvania Ave. in Southport, which of course was old NY 14 (becoming Broadway in Elmira). SB after the shield atop this page. Guess the city speed limit isn't 40 after all (should be 30). Don't want to mislead people - you lose out on 10 mph of ticket revenue that way. Old railroad overpass just west of the Parkway. Old arrow below the 17 shield may date from the time when NY 14 turned here at NY 352. 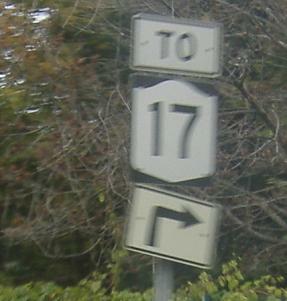 A piece of old NY 17 remains west of Horseheads to serve as the NY 14/NY 17 interchange. 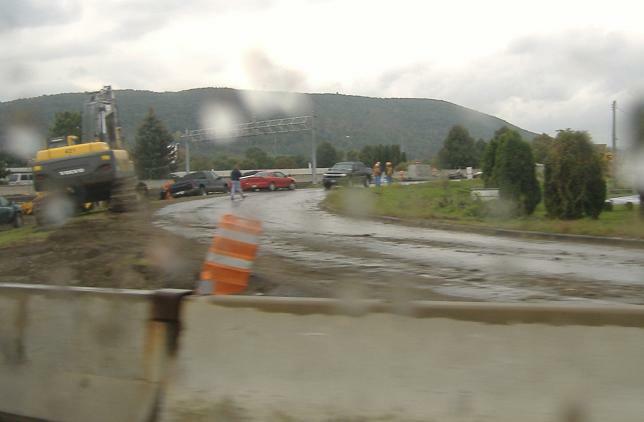 This is the NY 14 SB-Old 17 WB ramp, currently closed (in September 2006) while work on the Horseheads Bypass (to become I-86) continues. NY 14 SB approaching that ramp above. If the I-86 and NY 17 shields look squished, it's because in the future only the I-86 shield will be there, but for now this sign is completely accurate. Further north, on NY 14 NB, courtesy Doug Kerr. Can Penn Yan Cook?